Be sure to check the policy with whichever hotel you choose, but if possible, book more rooms and cancel later when Grandpa decides he isn’t up to the seven-hour drive. It is far easier to cancel than to try to find a room in February for May graduation for Aunt Sadie who decided she just can’t miss it. I actually booked three rooms originally, but only used two. And book those rooms in separate names. If Aunt Sadie or Grandpa can’t make it, it is very difficult to cancel just the one room if it was put through as one reservation. August and December graduation reservations may be a tad easier, but there are far more students graduating then than you may think, so don’t hesitate to book early. As you know, UCF is an enormous school. Besides, in December, there is still a lot going on with students moving out for winter break. 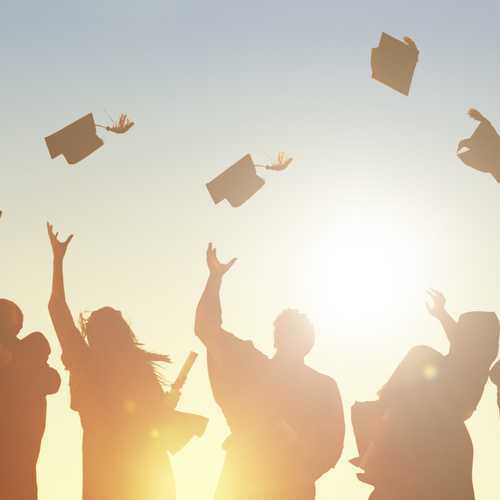 As of today, the next few graduation dates are the weekends of May 2nd through 4th, 2019, August 3, 2019, and December 13th, 2019. You might not know which of these days and time is for your student’s major until a few months before though. Here is the schedule for May 2019. You will see that particularly for the May graduation, there are so many students graduating they split it into multiple ceremonies throughout the day and evenings. Graduation takes place in the UCF Arena. The Arena bans pepper spray, pets (unless indicated a service animal), outside food and drinks, selfie sticks, free-standing photography equipment, strollers, and e-cigarettes. CFE Arena does not allow backpacks of any kind or bags larger than 12” x 6” x 12” inside the arena. Guests who bring backpacks or large bags will be asked to return them to their car before entering the building. Accessible seats need to be purchased through the box office and are first come first serve. Doors open 90 minutes prior to graduation. No re-entry is allowed for the Arena so don’t leave; they won’t let you back in. There are concession stands inside as well as flowers for sale outside. And don’t worry if you someone can’t make it. They can always watch the live feed by finding their specific ceremony here. Handicapped graduates – contact Student Accessibility services (407-823-2371) if you have hearing or visual impairments, are in a wheelchair, use a motorized scooter, service animal, assisted listening services, or to make special arrangements. Handicapped guests – arrive at least an hour and a half early before your scheduled ceremony. Park in Garage D. Wheelchairs are not provided so bring your own if needed. There’s an elevator through the main entrance that guests and one companion can use to get to the accessible seating section. Reserved seating is provided. Remember to make restaurant reservations as well. Generally, restaurant reservations can’t be made as far in advance as hotels, but due to the crowds, you will definitely want a reservation. I actually called so far in advance they couldn’t make it yet but told me when to call back so I could be one of the first to reserve the date and time I needed. I marked my calendar and all worked out beautifully. Many restaurants will ask for a non-refundable deposit in the event you do not show up. If you do, they will just apply it to your bill. Check out our Graduation Restaurant Reservations blog. For more suggestions, read our Restaurant blog. Not enough tickets? There is actually a lottery to get more than the four tickets each graduate is allotted. There is, however, a ticket lottery where students can request up to 4 more tickets through their my.ucf account. Although you can hope for the raffle for free tickets, many students sell their tickets on UCF class of ____ pages so don’t panic if you don’t get extra through the lottery! Here is the link for the ticket lottery. Insider tip – If you are looking at the stage, its best to sit on the left side so you can see your student get off the stage and take pictures!! Cap and gown cost $79.98 to rent. Students must return the gown but they keep the cap, which many students will decorate. A souvenir tassel is $15.98; both through Herff Jones. Tassel colors are determined by the college they are graduating from. If your student is buying their tassel from somewhere else, the colors are as follows: Arts and Humanities=White; Business Administration= Drab; Education and Human Performance= Light Blue; Engineering and Computer Science= Orange; Health and Public Affair = Kelly Green; Medicine (Burnett School of Biomedical Sciences)= Science Gold; Nursing = Apricot; Office of Undergraduate Studies= White; Optics and Phonology= Aqua; Rosen College of Hospitality Management= Pineapple; Sciences= Science Gold. In mid-February, graduates will have to fill out a form for cap and gown sizes and pick them up the last week in April. After graduation is over students have one hour to return their caps and gowns. I know you are going to want some great photos. Many students (particularly photography enthusiasts) will offer their services to take some amazing pictures around campus for a reasonable price days before graduation. Check Facebook to find your student photographer. Students may want to schedule a few weeks early as classic UCF places, including the fountain, the college they graduated from, the library, Memory Mall, Student Union seal, Pegasus Statue and the football field, tend to get very crowded. I have some amazing photos of my graduates that are beyond Instagram worthy that were taken by a photography major. Encourage them to book their photo session very early in the morning when it isn’t so hot. And once you get there and want those family pics with your student adorned in cap and gown, be sure not to leave it for right before or after the ceremony, because that is what everyone else will do and you will literally wait in a LONG line to snap in all the key places that scream Knight. Our intern has a twin graduating from another state university at exactly the same time. She was able to get permission to walk during a different ceremony so that her parents can then make her sister’s graduation ceremony. She contacted the Graduation Coordinator at the Registrar’s Office. (email is mary.collington@ucf.edu and office number is 407-823-2842). Our intern’s request was sent to the Office of Presidential Events and her switch was approved. She will need to exchange her tickets for the ceremony when she picks up her cap, gown, and tickets at Millican Hall.